PEOPLE OF FRANCE: The Republic only has the Ballot Box to fight against the Barricade. Can’t you see how ridiculous this is? We need to throw republican institutions into the dustbin of History. They are powerless and out-moded. * To avoid the spectre of civil war, the Republic once again throws the French people into partisan conflict and electoral competition. 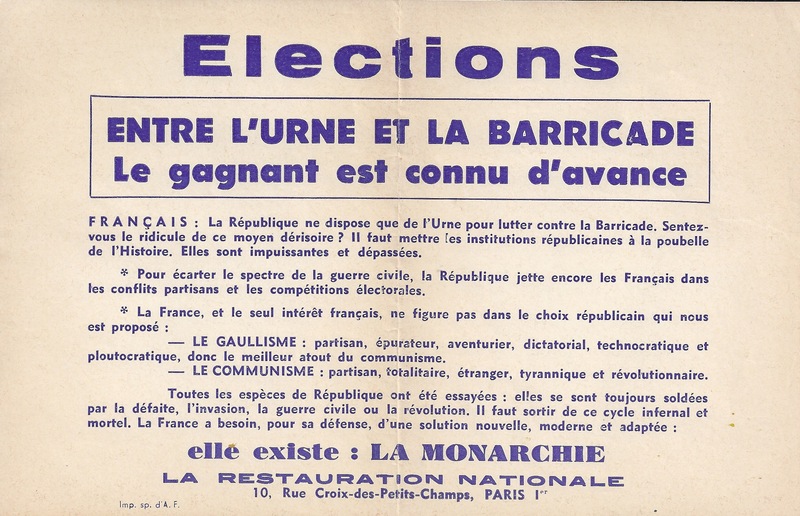 — GAULLISM: partisan, purifying, adventurist, dictatorial, technocratic and plutocratic, thus the best trump-card to communism. — COMMUNISM: partisan, totalitarian, foreign, tyrannical and revolutionary.